The recently renovated 3-star Hotel Belvedere overlooks the seafront of Misano and faces the beach. It offers many services to children and has parking, WI-FI and rooms for the disabled. Accept animals of all sizes. 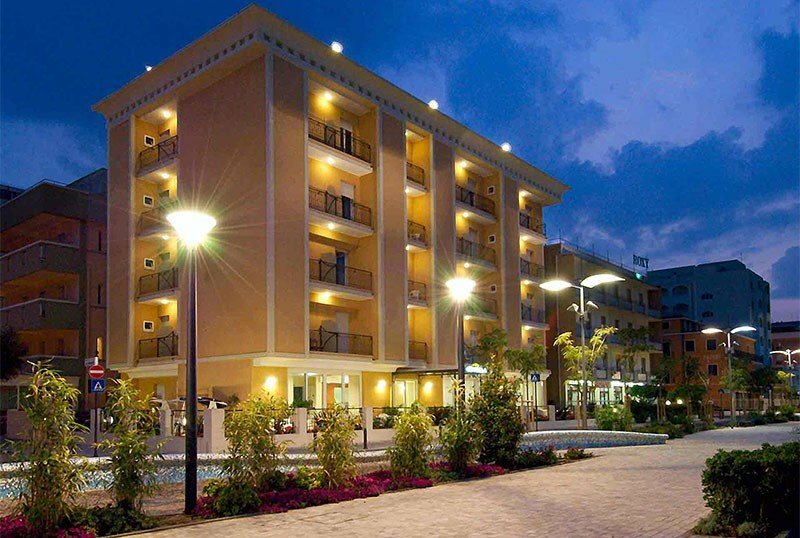 The hotel overlooks the seafront of Misano Adriatico: just across the road to reach the beach. The train station is less than a 10-minute walk away. The Misano racetrack is easily reachable by car. Of the 47 soundproofed rooms available, 34 are with sea view and 4 with disabled facilities. The rooms have a balcony, air conditioning, WI-FI, safe, telephone, satellite TV and digital terrestrial, shower and hairdryer. On request: minibar and breakfast in the room. Garden, open-air porch, free bicycles, reading room, bar, elevator, beach towel, newspapers, theme nights, laundry service. PARKING: uncovered and free, unguarded. Limited seats. CONVENTIONS : beach, shuttle service. Possibility of organized excursions. SERVICES FOR DISABLED : there are 4 rooms suitable for the disabled (room with wheelchair maneuver and aids, shower with wheelchair access). Elevator up to standard. LUNCH AND DINNER : local cuisine with 2 menus to choose meat and fish, pasta and homemade desserts. Meals are accompanied by a careful selection of local and national wines. Drinks at meals are included in the all-inclusive formula. VARIATIONS : vegetarian cuisine, vegan cuisine (on request). Variations to the menu are possible. In the hotel: outdoor playground area, strollers. On request: pediatrician and baby sitter. At the beach : baby / mini / junior club. The hotel has an agreement with the baths Bagni 42/43/44/45 with services reserved for adults and children. The Bagno Romeo n.42, specifically, has a job chair for the disabled. Prices are per day and per person in a double room and do not include the City Tax. TOURIST TAX: excluded, € 0.90 per person per day for a maximum of seven days, children under 13 are exempt. If in room with 2 adults.